Date | Time Friday, Feb. 8 | 7:05 p.m.
Sudbury, Ont. – The Firebirds will play their second of three consecutive road games in Sudbury Friday night. Puck drop is set for 7:05 p.m. (ET) at the Sudbury Community Arena. Friday marks the eighth all-time meeting between the two clubs where Flint holds a 5-1-1-0 record against the Wolves since 2015. The Firebirds are 2-1-0-0 in Sudbury. Thursday is also the final meeting this season and the only contest in Sudbury. The one prior meeting between these clubs this season was on Jan. 5 in Flint. The Firebirds used five unanswered goals en-route to a 5-1 victory over the Wolves. Hunter Holmes, Jack Wismer, Jake Durham, Ethan Keppen and Kyle Harris all scored for Flint. Defenseman Tyler Deline picked up his first career OHL point in his first career OHL game. Luke Cavallin stone-walled the Wolves, stopping 27 of 28 shots from the opposition and earning ‘First Star’ of the game. The Wolves enter the contest with a season record of 31-16-2-1. They sit second in the Central Division and third in the 10-team Eastern Conference. They’ve won eight of their past 10 games, and their past six-consecutive contests. The Firebirds are fifth in the West Division and 10th in the Western Conference. On special teams, the Wolves rank 20th in the OHL on the power play, scoring 13.8% of the time. The Firebirds are 19th converting at a 14.1% clip with the man-advantage. Sudbury ranks third on the penalty-kill, shutting down the opposition 81.9% of the time. 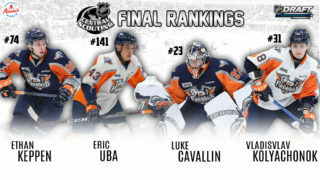 The Firebirds are killing penalties at a rate of 70.2%, which is 19th-best in the OHL. Second-year forward Ethan Keppen remains red-hot, now with five goals in the past three games. He has picked up points in 14 of his last 15 contests. Overall, he ranks third on the squad with 44 points (22G, 22A) through 53 games-played. Firebirds’ captain Ty Dellandrea (Dallas Stars) leads Flint in assists (36) and points (53) through 47 games. 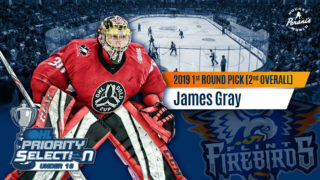 Alternate captain Jake Durham leads Flint in goals (31) and is second on the Firebirds’ roster with 49 points in 53 games. Since Dec. 16, Jack Wismer has tallied 20 points (10G, 10A) in 19 games. On the back end, second-year defenseman Riley McCourt has played in 35 games this season, and tops the defensive troops in goals-scored with five. He has 25 total points for the campaign, and is riding a six-game point streak (6A) into Friday’s contest. McCourt ranks 14th among OHL defensemen averaging 0.71 points-per-game. First-year rearguard Vladislav Kolyachonok also has 25 points (3G, 22A) for the season, topping all first-year players through 39 games-played. In net, overage goaltender Emanuel Vella holds a 4.91 goals-against average (GAA) and a .874 save percentage (SAV%) across 32 appearances. Last night, Vella backstopped Flint to an overtime defeat versus the Battalion in North Bay. Second-year goaltender Luke Cavallin has a 5.26 GAA and a .865 SAV% after appearing in 28 contests. Vella and Cavallin each have four wins between the pipes. Adam Ruzicka (Calgary Flames) joined the Wolves mid-season from the Sarnia Sting. He now holds the top spot in assists (31) and total points (51) for Sudbury. He rides a six-game point streak (5G, 4A) into Friday’s game. David Levin was the first overall draft pick in the first round of the 2015 OHL Priority Selection, and is in his fourth season with the Wolves. He currently ranks second in total points, with 42 (18G, 24A) in 43 games-played. 2018’s first overall pick was Quinton Byfield, who has 18 tallies and 41 total points through 46 contests. Blake Murray was the Wolves’ first round pick (seventh overall) taken in the 2017 OHL Draft, and tops the squad in goals-scored (22). Liam Ross leads Sudbury’s defensive unit with six goals and 18 assists through 50 games. The Wolves also feature a set of twins from Sault Ste. Marie, Ont. named Darian and Drake Pilon. The brothers were signed as free agents prior to the 2016-17 season. Darian plays left wing, and has 12 goals and 15 helpers this season. Drake plays right wing, and nine goals and 13 assists. They have combined for 144 points across the past three seasons. Between the Pipes: The Wolves have the number one netminder in the OHL in practically every category. Finnish netminder Ukko-Pekka Luukkonen (Buffalo Sabres) was named the ‘OHL Goaltender of the Month’ for December. His goals-against average (GAA) is best in the OHL at 2.40. He carries the league’s best save-percentage (SAV%) at .921. He is the only goaltender with five shutouts this season. He has 28 wins (tied-1st) in 37 appearances in the 2018-19 campaign thus far. First-year goaltender Mitchell Weeks, the first overall pick in the 2018 OHL U-18 Draft, has one win through four appearances. Weeks carries a 4.00 GAA and a .860 SAV%. NHL: Sudbury has three players with NHL ties, consisting of Cole Candella (Vancouver Canucks), Ukko-Pekka Luukkonen (Buffalo Sabres) and Adam Ruzicka (Calgary Flames). Additionally, centerman Blake Murray and defender Liam Ross were among the 50 OHL Players in NHL Central Scouting’s Midterm Rankings ‘Players to Watch’ list for the upcoming NHL Draft. In the past 25 years, the Sudbury Wolves have produced 20 professional players that have played at least 200 NHL games. In the 60-team CHL, no team has produced more long-term NHLers in that time frame. Notable Sudbury alumni to play in the NHL include Mike Fisher, Nick Foligno, Dave Hunter, Derek MacKenzie, Ethan Moreau, Glen Murray, Sean O’Donnell, Mike Peca, Warren Rychel, Alexei Semenov, Marc Stall, Steve Staios, Pat Verbeek, and Mike Wilson. Friday evening’s contest against the Sudbury Wolves can be heard live on the radio throughout Flint & Mid-Michigan on US 103.1 FM, online at www.us103.com or by downloading the US 103 app here. Dominic Hennig will call the play-by-play action on the Flint Firebirds Hockey Radio Network. Pregame coverage will begin 30 minutes prior to puck drop at 6:30 p.m. The game will also be televised live in Sudbury on Eastlink TV channel 10/610 (HD) for Eastlink TV cable subscribers. In addition, the game will be televised province-wide throughout Ontario on the OHL Action Pak on channel 457 for Rogers TV cable subscribers and channel 488 for Cogeco TV cable subscribers. OHL fans with cable television in Ontario can add the OHL Action Pak to their television plan to catch the Firebirds in action, home or away all season long. 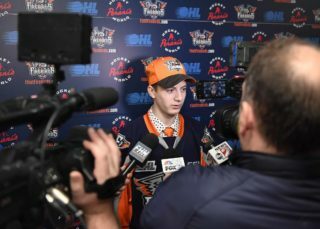 Along with Friday’s game, 65 of the Firebirds’ 68 games throughout the 2018-19 season are also scheduled to be televised live across the province of Ontario on the OHL Action Pak.